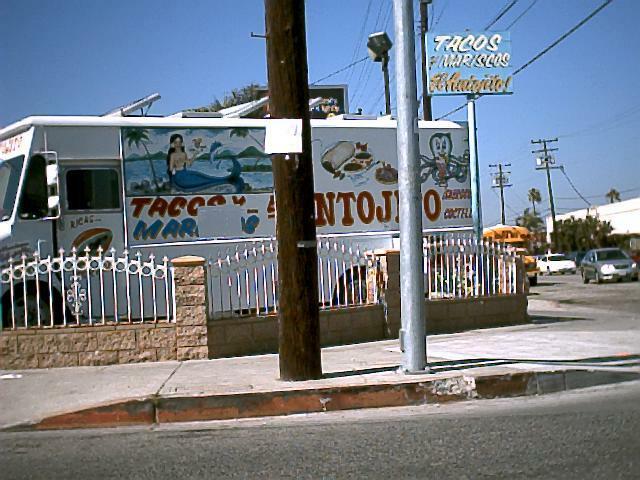 I decided that it was time to head south with my taco journey and acting on a tip from a reader I found myself at a taco and mexican seafood truck in Gardena called El Antojito .El Antojito is on the corner of Figueroa and 168th st on a big lot that also houses a juice bar as well as a large shaded seating area. What at first looked like a simple taco truck turned out to be quite an operation. This isn't your ordinary taco truck my friends. When you place your order you get a reciept and when your order is ready you'll hear your number over a speaker system. I took advantage of this by walking over to the juice bar and sitting under the tented patio area drinking a jarritos while I waited for my order to be called. 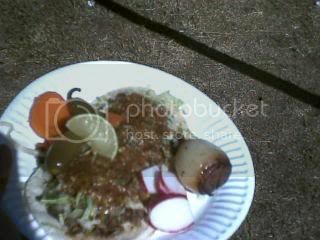 My asada tacos arrived with a generous helping of veggies:marinated carrots,radishes, a jalapeno and a whole grilled onion. I love when taco trucks do this. I hardly ever eat the onion and radishes but I just like having it on my plate when I get my tacos. Sometimes I use the radishes to scoop up any meat that's left on the plate. Right after I took this photo the onion fell off my plate and rolled into the street. It was quite busy but my order came quickly. After the first bite I knew this taco was a winner. The beef had a nice pepper flavor to it and the salsa was smokey and mild with some sweetness to it. The tomatillo based salsa was much different than the spicy red sauce many taquerias put on their tacos but it was still very good. Besides tacos, tortas and burritos El Antijoto also has a large selection of seafood cocktails and seafood tostadas. I was tempted to order one of them after eating my tacos but decided against it when a longer line started to form. 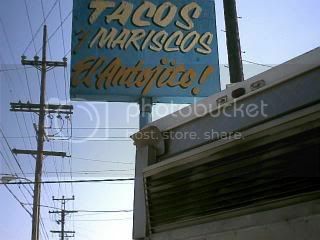 I will definetly be going back to El Antojito to sample their other meats as well as their mariscos. But until then another taco journey is complete and it is time to head west. 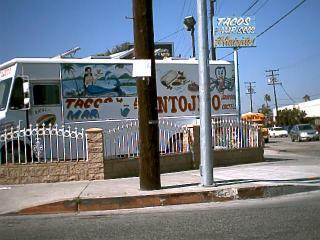 El Antojito is on the corner of Figueroa and 168th St in Gardena. Tacos are $1 each. This is a great blog. I am just beginning to like tacos and your blog will help me explode further. 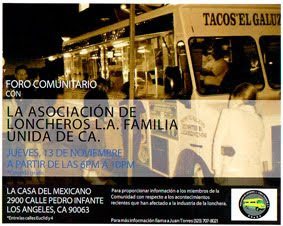 Great job, Bandini, for discovering taco trucks in the South Bay. Even though I've lived here a long time, I haven't thought of looking out for them more. BTW you need to review Acosta Taco - two locations, one on Imperial west of Hawthorne Bl. and on Labrea at Florence. Oh where oh where can the great Bandini be?? Anyway, I recently went to El Antojito and I was sorely disappointed. 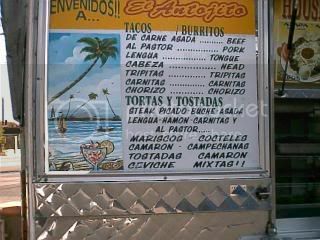 First off, I ordered the tacos de lengua and what I got was lengua tacos...TOPPED WITH LETTUCE AND CABBAGE!! I expected to see some cebollas and cilantro topped with salsa and I did...ON TOP OF A BED OF MIXED LETTUCE AND CABBAGE!! Sir, take thee immediately to El Gallito Taco Truck near the corner of PCH/Vermont. Taco love is consummated there with great pleasure by such of us that love fantabulous authentic tacos of the street variety.